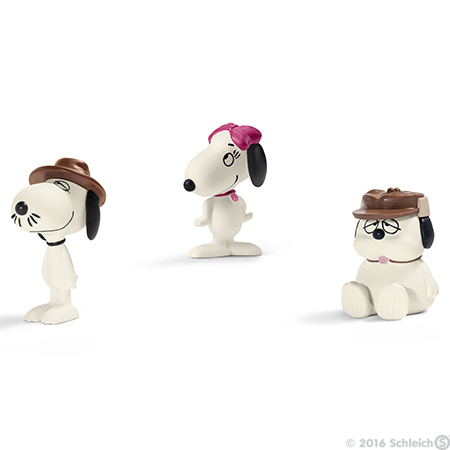 Set of 3 Snoopy's Siblings Figurines. Brand new in original packaging. Figures were made by Schleich in 2016. Each figure is about 2 inches tall and made of plastic. Belle, Spike, and Olaf are three of Snoopy's seven siblings. Olaf is homely, Spike wears a hat, and Belle is Snoopy's pretty sister. Snoopy only rarely meets up with his siblings. They were all born on a farm and were then scattered to the four winds. Spike lives in the desert and is rather scrawny. He always wears a hat and a moustache. This makes him look rather grown-up. Unlike Spike, Olaf is quite fat and was bestowed with the dubious honour of winning the ugliest dog competition. Belle, in contrast, enchants all with her beauty. You can't help loving her.